EghtesadOnline: The Philippines vowed to destroy those behind twin bombings that killed 20 people during a Sunday church service in the country’s restive south, six days after a referendum on autonomy for the mainly Muslim region returned an overwhelming “yes” vote. The attack wounded 81 and was one of the deadliest in recent years in a region long plagued by instability. It came amid hope and excitement about the ratification of a devolution plan that aims to bring development, jobs and peace to one of Asia’s poorest and most volatile places. 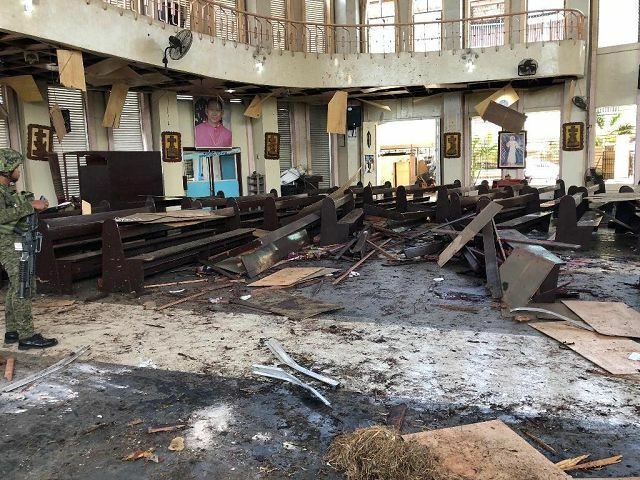 The first explosion went off inside the cathedral on Jolo island, in Sulu province, and was followed by a second blast outside, which was detonated as security forces raced to the scene, Reuters quoted the officials as saying. “The enemies of the state have boldly challenged the capability of the government to secure the safety of the citizenry in that region,” said Salvador Panelo, spokesman of Philippine President Rodrigo Duterte. “They want to show force and sow chaos,” national police chief Oscar Albayalde told DZMM radio, suggesting Abu Sayyaf was the prime suspect. Jolo is a stronghold of the group, which runs a lucrative piracy and kidnapping operation that successive governments have failed to break up. The group, which operates in the waters and islands of western Mindanao, has beheaded numerous foreign captives when ransom demands were not met. The attack followed Friday’s announcement that the region, a mainly Muslim part of the predominantly Catholic Philippines, had ratified the creation of an autonomous area called Bangsamoro, with 85 percent of voters behind it. Defence Secretary Delfin Lorenzana called the attack a “dastardly act” and urged the local population to cooperate and “deny terrorism any victory”. National Security Adviser, Hermogenes Esperon, called those responsible “mass murderers” and “extremist criminals”. “We will not allow them to spoil the preference of the people for peace,” he added.